12th Street has been redesigned into a tree-lined boulevard with signalized intersections and crosswalks and a landscaped median. The redesign creates significant new parkland at the south end of Lake Merritt Park, removes unsafe and unsightly pedestrian tunnels, provides safer and continuous access for pedestrians and bicyclists along the perimeter of Lake Merritt, and improves access between the Kaiser Convention Center and Laney College. Removal of the Lake Merritt Channel culvert at 12th Street provided an open-water bridged connection and improve water flow between the Lake and the Estuary. Environmental benefits include improved water quality and wildlife habitat. View the City of Oakland 1/29/2014 Project Report, with description, images, plans, funding detail, and status. View the City of Oakland illustrative plan for the project. Read Measure DD and Lake Merritt Boulevard, a brief history of this project that was published in the East Bay Express June 9, 2013 Love Our Lake Day event guide. 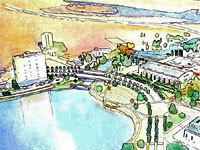 Lake Merritt transformation on the horizon, June 28, 2011, Oakland Tribune. Demolition Project Should Reduce Odor from Lake Merritt, June 14, 2011, Bay Citizen. Maintenance. The project will be maintained the City of Oakland with funds provided by the Landscaping and Lighting Assessment District. Internet Explorer users: Do not click [+] to zoom in due to recent bug in Google Maps. Click the marker for driving directions.